It may just look like a treat on a stick, but Vitakraft Triple Baked Crunch Sticks actually have much more to offer your furry or feathered companion than just a special snack. Formulated with ingredients specific for each type of pet, they are the ultimate long-lasting reward and healthy stimulation for pets. The treat portion of each stick is baked onto a natural wooden chew, and then attached to a clip holder for easy hanging inside your animal’s habitat. With the combination of wholesome ingredients, crunchy outer coating, and a wooden chew center, Triple Baked Crunch Sticks provide companions with both delicious, fortified nutrients and physical stimulation as they gnaw their way to the center. Leaving your rabbit pal at home and having a sitter check in on him while you are away on vacation? He’ll miss you while you’re gone! Leave him with his favorite variety of Triple Baked Crunch Stick to enjoy and keep him occupied while you’re gone. Unlike other treats that are gone in seconds or minutes, these treats can last for days. And even once the treat part is gone, your companion will still have the wooden chew center to channel his gnawing and chewing behavior. 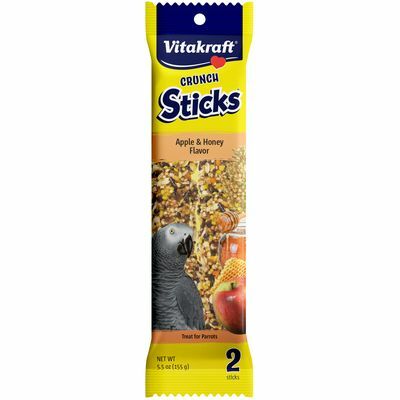 As with most Vitakraft diets and treats, Crunch Sticks are fortified with essential vitamins and minerals to help make sure your companion is getting all the correct nutrients it needs. All varieties are fortified with Vitamins A & D3, with extra nutrients in certain varieties depending on each species particular needs, such as Vitamin C for guinea pigs. Most small animals and all companion birds need regular chewing and gnawing exercise to maintain healthy teeth and beaks. Rabbits, guinea pigs, rats, mice, hamsters, gerbils, chinchillas, and degus all have teeth that grow continuously throughout their lifetime, which is why it's important that they wear them down with regular chewing. A bird's beak also grows continuously. Made of keratin, the same substance that makes up human fingernails and deer antlers, beaks can grow up to 3 inches per year! 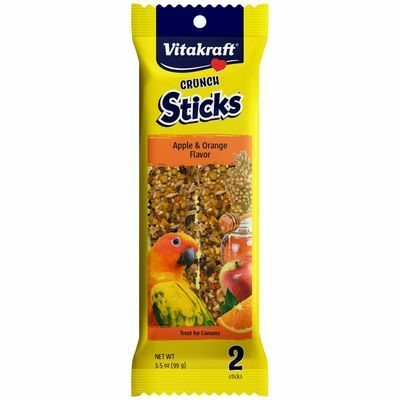 This makes chewing equally important for birds as it is for small animal companions, to keep their beaks evenly worn and fully functional. 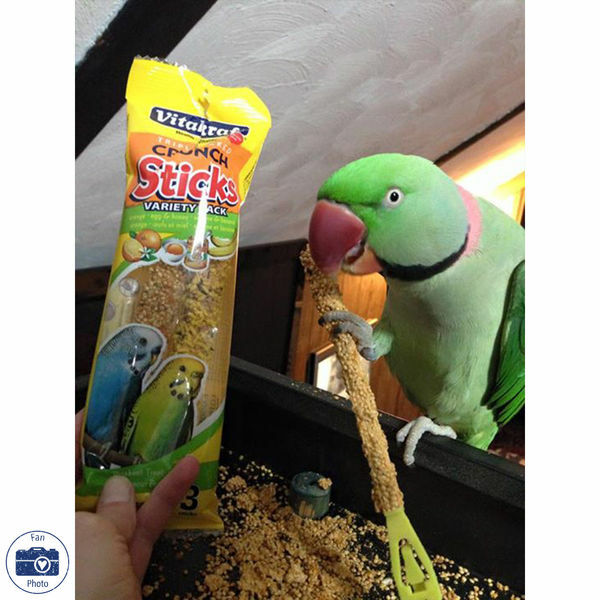 With the crunchy outer treat and the natural wooden stick center, Triple Baked Crunch Sticks offer both small animal and bird companions some of the important chewing exercise they need.